Problems.Strategies.Solutions. | Pen and paper and other (math) problem solving tools. Pen and paper and other (math) problem solving tools. 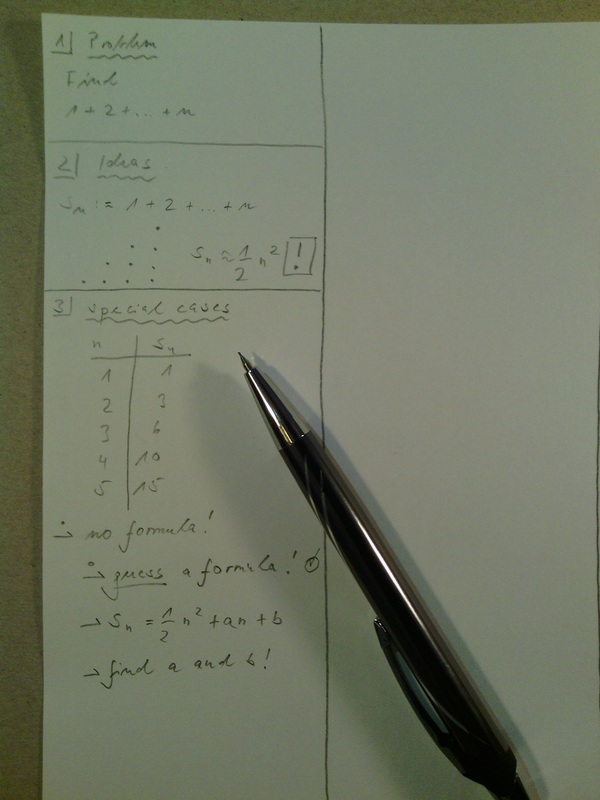 Here’s my latest collection of ideas on note-making and math problem solving, presenting a four column layout, the concept of note assistants and of “paper software”, loads of math problem solving tools and much more. Here’s my latest upload on note-making. Press the right button on the bar below the document to read it in full screen mode. How can I approach a problem? Are there established methods that work for a large variety of cases? How can I use them? How can I represent a given problem, using equations, diagrams and other means that allow a math treatment? It seems a reasonable next step to collect answers to these questions, thus composing a tool collection. Some of the following tools are taken from the list in George Polya’s book “How to Solve It”. Write down what is given and what is unknown. – Use coordinates – cartesian, spheric… Use a suitable origin. – Consider features of the problem (like symmetry) to make the representation simpler. Starting with these simple and fairly heterogeneous examples, here are some ideas on tool collections. I should aim for a tool collection that is of help to me – adapted to my knowledge, my experience and my fields of interest. Such a tool collection is evidently not static, but changes with time. How can a tool collection be recorded? From a tool collection that exists only in my mind to handwritten lists and vast computer-based tool libraries, there are all sorts of possible representations. I can try to improve such a list systematically. What are the main challenges in using a tool collection? I can use it before the actual problem solving process, to remind me of important processes, tools and practices. I can use it during problem solving to get cues. I can use it after problem solving to improve it for further use. How do I find – in each problem solving situation where I look for help – the tools that are useful just now? How can I apply these tools? In most cases applying one tool will not lead to an entire solution – so how can I deal with a sequence or with a combination of several tools? What should be in it, and what should be left out? This question has no general answer. In the following posts on tools, I will focus on general, domain-independent tools that seem to me very useful. For the time being, I ask my readers to compile their own tool collections. There are some starting points I have worked out in the past, see here and here. An example of an online repository is the Tricki (started by Timothy Gowers). Regrettably, it seems no longer under active development. 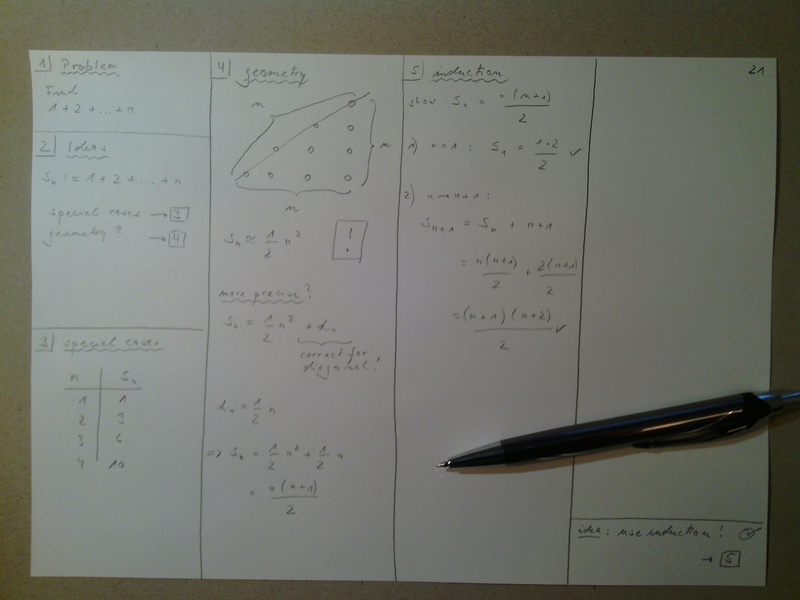 Besides, there are all sorts of math cheat sheets on the internet – here is a first impression. From my experience, they are of little help for solving most non-routine math problems. Following the posts on note-making in math and on basic thinking tools, here come first ideas on thinking tools for math problem solving. Finding a solution to a math problem can be broken down into parts in several ways – for example by asking questions. A first useful catalogue of questions could look like this, where each main question is followed by more specific ones. The next posts shall give some answers to these questions. How can I construct a solution? How can I generate seminal ideas? What methods can I use to generate ideas? How can I exploit these ideas? How can I start from what is given and work forward? How can I start from the end and work backward? How can I decide whether to proceed with an idea or whether to try a new one? How can I deal with multiple ideas? Should I produce several of them and pick the most promising one, or should I start with one and remodel it until it works? How can I make sure I realize there are obstacles that need attention? How can I use established ways of dealing with obstacles? How can I analyze an obstacle? How can I generate ideas to overcome an obstacle? How to deal with other troubles? How can I deal with frustration, with the impression that I’m no good at math, with a lack of interest? Remember: Looking back should happen not only at the end, but also on the way! What’s bothering me? What doesn’t feel right? How can I clarify these intuitions? How can I check if my solution is correct? What can I learn from what I’ve done so far? Finding answers to these questions may lead to a collection of math problem solving tools. Read more in the next post. I see no need to use the symbols all the time – when my work flows without them, everything is fine. But when I get stuck, using = “What’s wrong here?” very often helps. The symbols are designed for quick writing. I gave the question “What would be logical?” the most simple symbol since I use it most often. The questions are designed to be “fail-proof” in the sense that they should lead to some progress in practically every situation. The exact phrasing of a question seems to me a matter of personal liking. Instead of “What would be logical?” you might try “What would be natural?” or a simple urging “So?!”. There are countless other possible symbols and questions. The above three questions, with their focus on obstacles, options and next steps, seem essential to me. If the question “What could I do?” leads me to several options that are worth trying, I use for each of them a circle “o” as a reminder for examination. Later I can tick off the options I have tried. Next comes a post on Math Problem Solving Tools. Arguably, a large portion of thinking about math problems is done by people brooding over a sheet of paper, pencil in hand. So it is perhaps worth asking what a good note-making technique should support, and how it could do that. Here’s a note-making technique that works for me – with some remarks on variations. The advice is embarrassingly trivial – the later ideas for its usage lead to results that are not, as I hope. I use blank paper in A4 format and a mechanical pencil with an eraser. I use only the front side of the sheets – I want to see all material that’s on a sheet. I take the sheet in landscape format, add a page number and the date and draw three vertical lines to form four columns 1 to 4. If the columns are too narrow for your work, reduce their number (but not to one). On A3 paper, you can have a larger number of columns, or you can take it in portrait format and use four columns each on the upper and lower half of the sheet. I start in column 1, where I write down the math problem in a box labelled “1” – see the example below. In further boxes labelled “2”, “3” etc., I do ordinary math notes, using equations and diagrams as usual. To show that one idea is subordinate to another, I indent lines, as in an outliner software. When I’m finished with some segment of thought, I draw a horizontal line to form a box, leaving some extra space for later additions. If I want to start a new chain of thought, I can start with a new column – this is why having several of them is a good idea, and why the A3 format may be great. Sometimes it’s convenient to use the right neighbour column for comments and reflection. If necessary, I use arrows to connect boxes, or I use the referencing described below. page 1.1 between pages 1 and 2, page 1.0.1 between page 1 and page 1.1 etc. 1) I simply reference the box number. 2) I imagine the 4 columns being separated in four segments a, b, c and d. When I want to reference something starting in the middle of column 3 on page 7, I use the reference 7:3c. On the same page, I use just 3c. When I come across an idea that I want to check later, I take a note and mark it with a circle “o”. After having examined the idea, I tick off that circle. When a sudden idea doesn’t fit in the current line of thought, I note it in column 4 segment d, filling column 4 from bottom to top, if necessary. Starting at the bottom leaves the top free for ordinary notes. Here are some side remarks on note-making. Possible design: If your notes are messy and unreadable, find a layout that gives a clear structure to your notes – I’ve tried this with a four-column layout. Find writing material that makes readable handwriting easier – avoid blunt pencils and use checkered paper etc. Possible design: Collect questions in one column, number them and find answers while using boxes in other columns. Some graphic organizers are sheets with prefab structures, where students have to fill in content. They are often used for younger students and simpler problems, and studies show their usefulness (see again here). Is it possible to harness their power for more complicated problems? Math problem solving is like an expedition, where you cannot plan the path to your destination in advance – you walk the first mile, see what lies in front of you and then decide about your next steps. Sometimes you have to go back, or you have to overcome obstacles you couldn’t see at the outset. This is why a single general graphic organizer will probably not work. What’s more promising is the flexible use of several specialized graphic organizers – choose from a collection the one most suitable for the current problem situation, and from this sequence of graphic organizers build a solution. In most of the books about math problem solving I know, there is not much material on note-making, and detailed advice on the topic or reproductions of notes (made-up or real) is very rare. a) Compared with the math content, most remarks on notes look shallow and arbitrary. b) Reproductions from an actual problem solving process need lots of printing space in a book and lots of explanation. Next comes a post on Basic Thinking Tools.